The steel revolution seems to be upon us. Once an AR-15 shooter realizes they can shoot for a fraction of the price for most shooting activities and not harm their rifle, it’s pretty much a quick transition to steel for plinking or general target use for AR platform users. 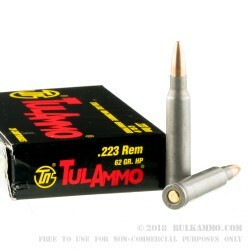 The TULAMMO line of steel .223 ammunition presents a large discount to traditional brass cased cartridges with few concessions. The cost to play in the bulk shooting arena with steel is a significant reduction to traditional ammunition with brass casings. 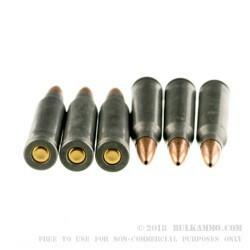 The 62 grain projectile is a nice grain weight for those who want a bit more versatility on longer ranges for hunting, or for those who have low twist rates (like 1 in 7 inches or 1 in 8 inches) because the bullet stability is good out of those guns and the longer sustained trajectories favor a pairing like that offers. The steel casings are not reloadable, and they tend to be best suited for guns that aren’t made to ultra-match type standards as the tightest tolerance guns can pose a feeding or extraction reliability concern at times. That said, there are few other concessions that must be made to realize the cost advantage of shooting steel. Q: I'm not familiar with the differences in brass and steel casings, what are the potential issues with firing steel cased ammo from an AR-15 as opposed to brass casings (if any)? A: The biggest difference is that brass obturates, or stretches to fill, the chamber, while steel cases do not. This can allow carbon to build up on the walls of the chamber. As long as steel ammo continues to be fired, this generally won't cause problems, at least not unless many thousands of rounds are fired. However, if brass cases are fired after steel cases have been fired and the chamber isn't cleaned before this transition, failures to extract may be encountered. This problem is easily solved with a quick chamber cleaning in between steel and brass cases.